You would think that a word like “celery” would denote healthy. After all, fresh celery is a good addition to any diet. Crunchy celery stalks contain a whole bunch of antioxidants that help fight inflammation. Along with some of the more well-known antioxidants like vitamin C, celery contains dozens of other beneficial antioxidants not commonly found in other vegetables. You’ve likely never come across names such as lunularin (part of the dihydrostilbenoids family of phenolics), bergapten and psoralen (commonly known as furanocoumarins). So when you see the words “celery extract” pop up on a list of ingredients, that’s a good thing, right? Not really. Celery extract has very little in common with fresh celery. 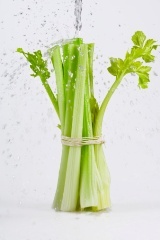 Celery extract is actually a source of nitrates. It’s used as a preservative in meat and fish to prevent harmful bacteria from growing. Sodium nitrate, a word you may be far more familiar with and which you may be a little more suspicious of, is used by manufacturers to preserve the color of pre-cooked meat. Sodium nitrate helps your hot dogs and luncheon meat look red or pink instead of grayish due to precooking. The problem with nitrates is that they form compounds called nitrosamines when broken down in your stomach. Nitrosamines have been linked to cancer. Now what about celery extract? Is it as potent as sodium nitrate and should be thought of as cancer-causing? Celery, like spinach, beets, parsley, lettuce, and cabbage has naturally high concentrations of nitrates. However, these nitrates are not thought to be harmful in the way that added sodium nitrate is. Nitrates that occur naturally in these veggies also contain vitamin C. Researchers have discovered that vitamin C limits the formation of cancer-causing nitrosamines. However, when celery extract is added artificially to so-called “natural” hot dogs or sandwich meats, you may be getting just as many harmful nitrates as those found in conventional products. You’ll want to do a little research before you convince yourself that by buying natural meats you’re being healthy. “Natural” is a word not regulated by any government organization. Food manufacturers have begun to capitalize on this loophole in a big way. Don’t be fooled by pretty pictures of cows grazing in grassy fields either. It’s amazing how the brain jumps to conclusions when it sees the word “natural” next to a backdrop of trees and grass and blue sky. In the end it comes down to ingredients and knowing what those ingredients truly are. In defense of processed meat manufacturers, it is pretty difficult to make prepared meats without using some nitrates. We all want our meats to look and taste a certain way and when they are already pre-cooked, nitrates may be the only way to preserve a palatable color and taste. The bottom line is: you’re going to have to eat prepared meats like bacon, sandwich meats and hot dogs in moderation – whether they come with a “natural” label or not. Fresh meat cooked at home is always going to be a healthier option. Don’t replace these fresh meats with prepared meats and think you’ll be just as well-off. “10 misleading food product labels in Canada: Marketplace investigation reveals dubious health and nutrition claims,” CBC News web site, February 3, 2012; http://www.cbc.ca/news/canada/story/2012/02/02/marketplace-lousy-labels-full.html, last accessed July 25, 2013. “What is Cultured Celery Extract?” EcoLiving London web site, July 8, 2013; http://www.ecolivinglondon.org/blogs/food-amp-drink/what-cultured-celery-extract, last accessed July 25, 2013.